So It Turns Out: We're STILL Cool! This article was posted on 28th September 2015. 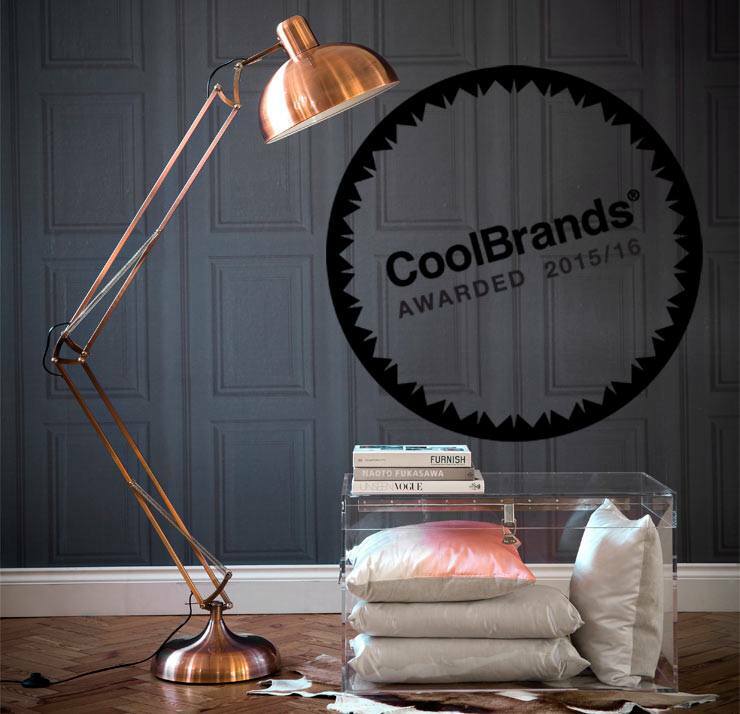 Since 2001, CoolBrands® have been canvassing the opinions of experts and consumers to produce a barometer of Britain’s coolest brands, people and places - and The French Bedroom Company are thrilled to announce that for the fourth (yes, FOURTH!) 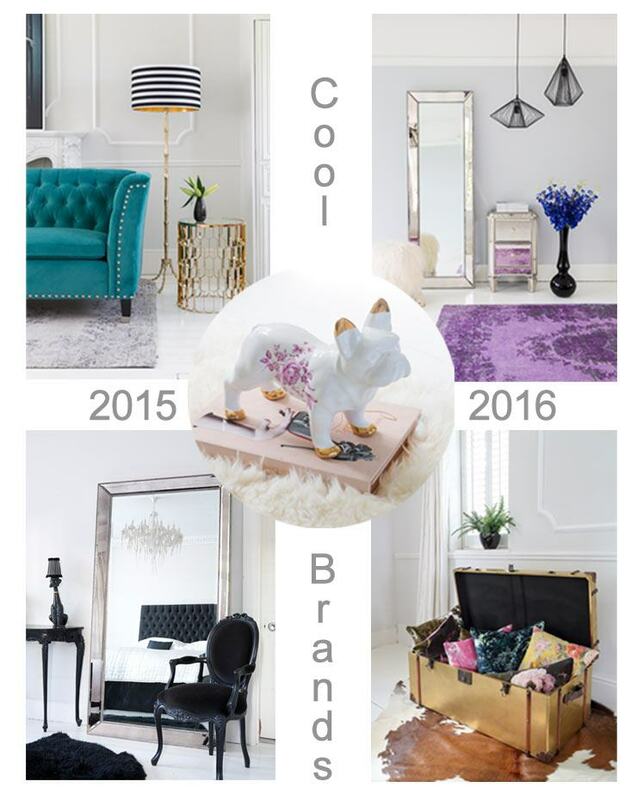 year running we've been awarded CoolBrands® status for 2015/16 - along with funky, edgy brands Charlotte Olympia (gotta love those shoes! ), Secret Cinema and Alexander McQueen; and some classic established companies which still remain at the forefront of their markets: Laurent Perrier, Apple and Mercedes-Benz. Copper Angled Floor Lamp, £180; Transparent Trunk, £580; Springbok Hide, £99. In the Home Decoration and Soft Furnishings sector, which is the category in which we are judged, brands that also performed strongly included: wallpaper gurus Graham & Brown, so hot they're cool radiator specialists, Bisque, and eclectic home wares emporium, Pedlars. From top left, clockwise: Charlotte Olympia, Courvoisier, Crussh, Daylesford, Dermologica, Destinology, First Direct, Fred & Ginger, Gaucho, GHD, Graham & Brown and Green & Black's Organic. At The French Bedroom Company our buyers are consistently searching out original products to help our customers on their quest for individual, beautiful homes. We're always on the look out for progressive, thoughtful and beautiful design, ensuring we are the first to know of new and much anticipated products by scouring the globe for, not only the hottest new trend but, for classically cool bedroom furniture, and, if we can't find what we're looking for - we'll design it! Our team of keen eyed buyers and diligent designers work putting together textures, colours and proportions to make our exclusively designed items heirlooms of the future and something our customers will truly treasure for a lifetime. Deco Decadence Side Table, £475. Antique Venetian Bedside Table, £345; Kilim Rug in Amethyst, £299. Residence Headboard, from £699; Black Sheepskin, £60. Picture 4: C.Columbus Brass Trunk, £299; Selection of cushions; Beige & White Cowhide, £195.